As someone who believes in the principle of “One person, One vote”, I demand that you process the more than 40,000 remaining voter registration forms immediately. Every eligible voter should have the chance to participate in the democratic process, no matter the color of his or her skin. My name is Ben Jealous. You might know me as the former President and CEO of the NAACP. 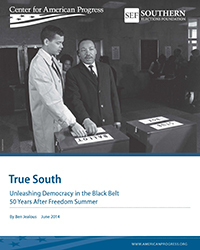 This month Julian Bond and I founded the Southern Elections Fund. Our goal: to build true democracy in the South. Our strategy: to support groups on the ground that are fighting massive voter suppression with massive voter registration. Our focus this week is on Georgia, where the principle of "One person, One Vote" is under attack. Early voting in Georgia begins on Columbus Day. But with less than 24 hours to go before polls open, Georgia’s highly partisan Secretary of State Brian Kemp is refusing to add more than 40,000 newly registered voters to the rolls – many of whom are voters of color. Join the Southern Elections Fund in demanding that Secretary Kemp add these voters to the rolls immediately. Secretary Kemp, whose job is to facilitate the voting process, has proven himself to be a highly partisan political actor. Last month he was caught on tape saying: “Democrats are working hard, and all these stories about them, you know, registering all these minority voters that are out there and others that are sitting on the sidelines, if they can do that, they can win these elections in November.” Now, at the start of Georgia’s high-stakes election, he is refusing to add more than 40,000 of these newly registered voters to the rolls. Add your name and tell Secretary Kemp to stop disenfranchising Georgia voters. The attack on voting rights is not limited to Georgia – it has spread like a cancer across the South and the rest of the country. If we lose this fight, we'll be fighting it again and again in states like Texas, Wisconsin and North Carolina – all of which have seen high-profile battles over the right to vote in just the past week. Join me in taking a stand against voter suppression. Will Georgia be the poster child for electoral racism and voter suppression? It's up to Secretary Kemp. He needs to know that you are paying attention – and that America is paying attention. Thank you for joining me in defending the sacred principle of “One person, One vote”. Voter suppression has, I recently learned, been going on since 1980, but it really got going in Florida in 2000. 2014 is showing ever more blatant attempts to keep minorities and poor people away from the polls. Republican presidents from Lincoln through Ford are spinning in their graves at the depths to which their party has sunk.